This past week I spied some very over ripe bananas sitting in a bowl on my counter. Every time I’d walk past, these bananas would call out to me, begging me to bake them into some banana bread. And really, who am I to refuse such a simple request? 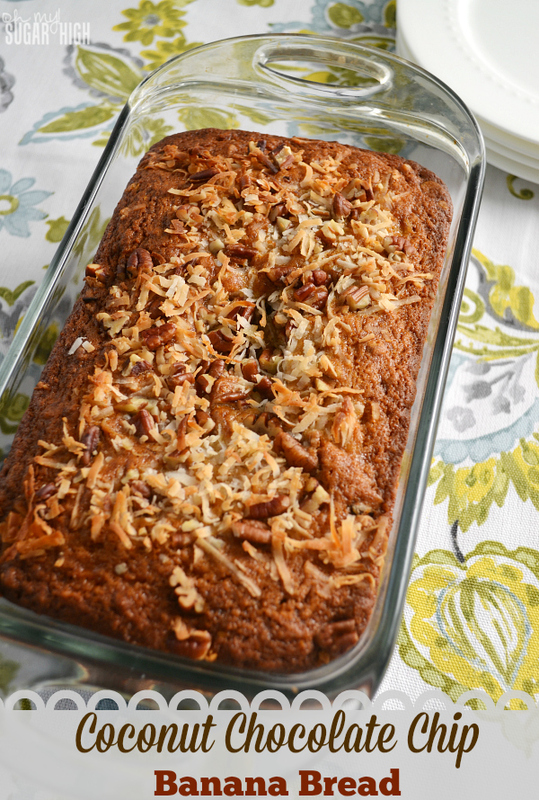 But while I love a traditional banana bread, I wanted to try something a little different. I’ve been a bit obsessed lately with coconut and really wanted to try out the flavor combination. When I started putting together my ingredients, my husband asked if I was going to make my chocolate chip banana bread. Not wanting to disappointed, I decided I’d throw just about everthing into this bread but the kitchen sink. And so, this bread was born. 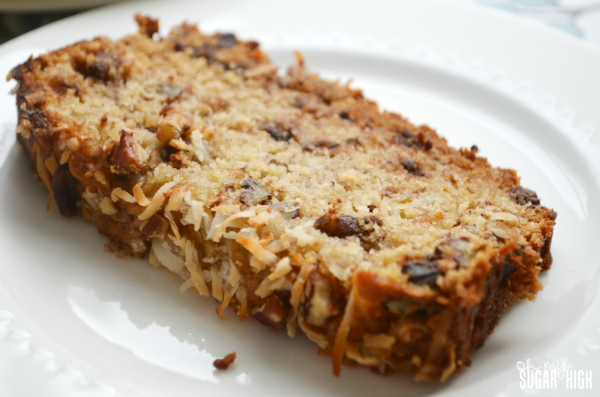 It is very similar to a seven layer bar but in banana bread form. And since it was gobbled up in 24 hours, I would say it is a winner. Like, “slap your mama, you have to have some more” good. (I don’t know if that is an actual saying, but if not, I’m making it one.) The topping makes it extra special and beautiful. Preheat oven to 350 degrees F (175 degrees C). Grease 9x5x3 inch loaf pan. In large bowl, stir together dry ingredients: flour, baking powder, baking soda, salt, chopped pecans, coconut, and chocolate chips. In separate bowl, whisk eggs until frothy. Add sugar and melted butter. Whisk well. Stir in mashed bananas, applesauce and vanilla extract until well combined. Add banana mixture to flour mixture and stir, just until combined. Sprinkle topping ingredients over batter. Bake uncovered for 55 minutes to an hour, or until a toothpick inserted in center comes out clean. Let stand for 10- 15 minutes. Remove from pan. Transfer to wire rack and cool completely. My husband woke up this morning and said, “Boy, it would sure be nice if we had some more of that bread.” Sorry, hon. Take my advice and make yourself TWO loaves. Wonderful I will make this again. 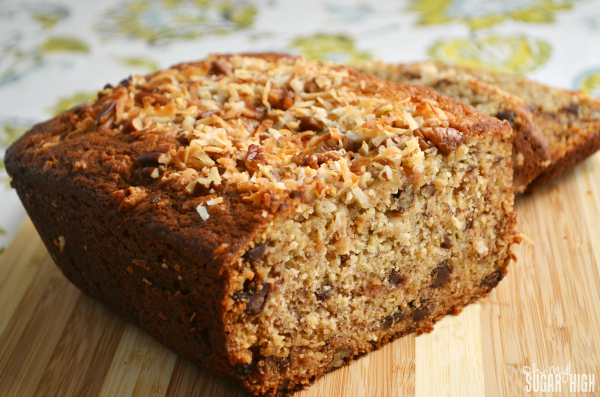 I love banana bread, and your recipe looks delicious with coconut and chocolate chips added! What a great combination of flavors…thanks for sharing! Wow! I just LOVE this recipe! One of the reasons is that by substituting the eggs this bread can be made for vegans like myself. Yay! 🙂 Thank you so much for sharing! I love coconut! I cannot think of a way that I would not eat it. I especially love it with chocolate or with pineapple. I cannot wait to fill up my kids awesome meters!! 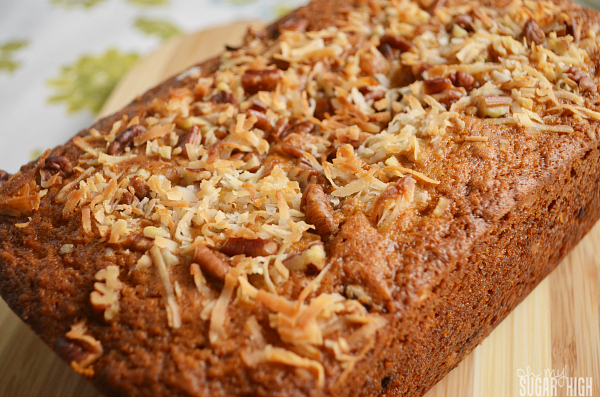 I’ve made a few different banana bread recipes but, have never tried making it with coconut. This looks really yummy! My kids would love this! Thanks for linking up with What’s Cookin’ Wednesday! Myself the pecans would just make me happy..Really do want to try this recipe. Will go with the one loaf until i find out what makes him happiest ha ha … Thanks a bunch .